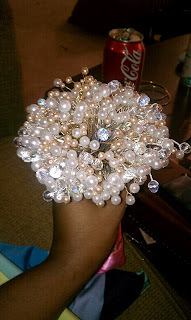 For those of you who have made a pearl bouquet, this can come in handy for sure! 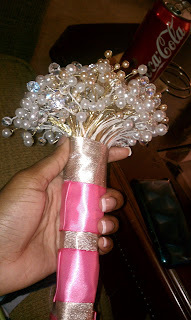 Those annoying, unsightly wire 'stems' are definitely something you don't want to be seen on your wedding day, and they aren't too comfortable to hold either, especially if you did what I did and used multiple types/color wire. I ran to Michaels and bought me some ribbon to wrap that bad boy up! 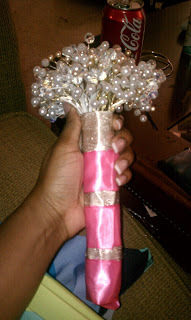 This is only a trial run, so it isn't that neat or exactly how I will be carrying it on my big day. But here's the finished product in all its shiny glory!